Pulitzer Amsterdam is unique among the luxury hotels in Amsterdam. The hotel comprises a block of 25 restored 17th and 18th century canal houses, ideally located in the old part of the city centre close to Amsterdam's main attractions. All guest rooms are distinctive, each giving you the feeling of being an integral part of the city's history. 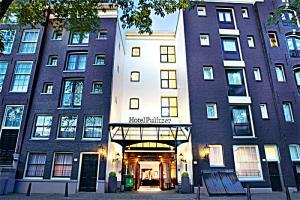 Located in the old part of the city centre of Amsterdam, 25 minutes from the airport.